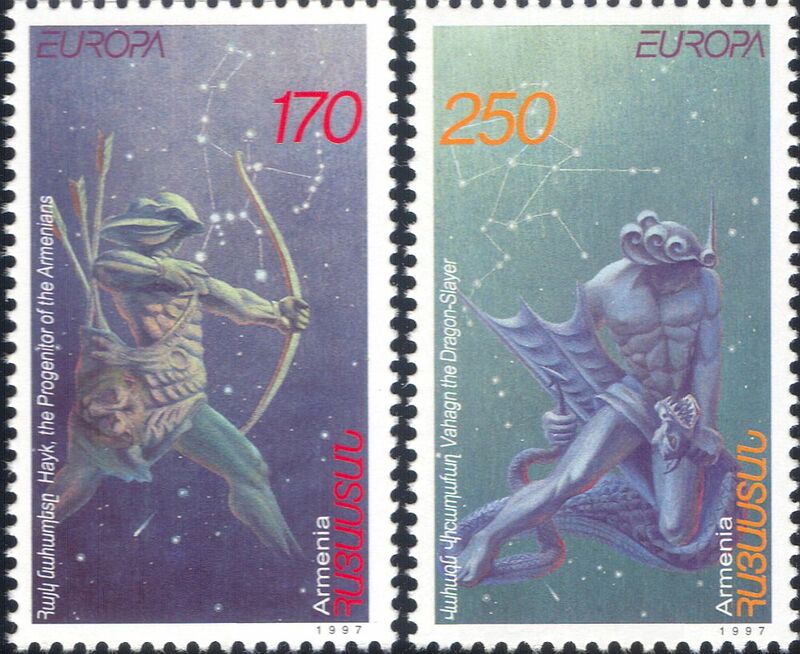 Armenia 1997 Europa : Tales and Legends 2 value set featuring Hayk the Archer, Progenitor of the Armenians and Vahagn the Dragon Slayer (The Song of Vahagn) - in superb u/m (mnh) condition (Stanley Gibbons 2019 Catalogue Value £11.75) - excellent country, people, heritage, history, myths, legends, archery, stars, constellations, space, mythical beasts thematics. If you cannot find the specific stamp set or thematic/topic you are looking for either here in my shop or at the brumstamp stamp shop on eBay http://stores.shop.ebay.co.uk/The-Brumstamp-Stamp-Shop please do not hesitate to contact me. Enjoy browsing and shopping. Andrea!